This irresistible pair of puffins is adapted, with permission, from the work of graphic artist Eleanor Grosch. Ann’s original border bands are executed in lighthouse colors that suggest the common habitat for these birds on rocky shores. The open background has similar undulating blackwork ovals and the rock is shared with two handsome starfish and a whelk carved by Michigan woodcarver, James Durow..
PREWORK: Some advanced preparation is required for this class. 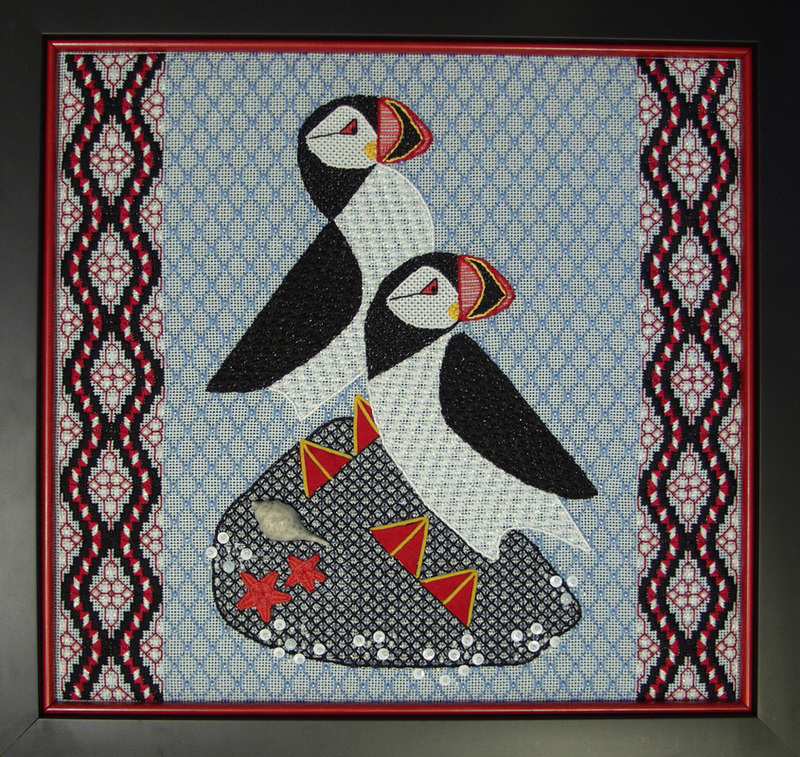 Students must establish the poked hole patterns for the puffins and then back stitch the outlines to connect the dots. Estimated time: 4-6 hours. Kit Contents: #5 and #8 pearl cotton, cotton floss, Kreinik metallics, Snow metallic, Impressions, Petite Very Velvet, Subtlety, and Mill Hill beads plus hand-carved whelk, eye beads and suede attachments. Student Supplies: Only the 16" X 16" stretcher frame and regular stitching accessories. Color Choice: No need since the colors used are appropriate to the subject matter and the landscape.